This is produced by Gough and Millar ( Smallville ), based on a series of books by Terry Brooks . It is set in a distant post-apocalyptic world. Humans live in a landscape filled the ruins of cities. But unlike Planet of the Apes the locals prefer to use magic instead of science. This is an unhappy combination of two genres - even the classic 1970s swordplay series The Horseclans chose to use Clarke's Law when magic was involved. Like in all cliched Young Adult novels, this starts with a gang of teenagers have their coming-of-age ceremony. In this case they are Elves, and they must run the gauntlet. This is a cross-country race where the contestants are blindfolded and have their arms tied behind their back. And typically, this time the protagonist is the first girl EVER to try for a boy's job. After the heroine wins, King Eventine Elessedil (John Rhys-Davies - Raiders of the Lost Ark ) delivers some exposition. The job of the elite guard, largely ceremonial, is to protect a magic tree. When the girl touches the tree, it gives her visions of the past ... or future. Allanon (Manu Bennett - Arrow ) the last Druid awakes from decades of sleep. He is able to provide even more exposition. Also, like Crixus and Slade Wilson he has a sword. Presumably he knows how to use it. Elsewhere, a farmboy inherits three magic blue stones from his dying mother. He sets out on a quest to find his fortune. He is a half-Elf, so evidently the Elves evolved as a sub-race of humans. The plot threads all start to tie together, although this makes the forest seem very small because the cast keep bumping into each other. Allanon (Manu Bennett - Arrow ) finds the whiny farm-boy, tells him he knew his father (a great hero) and takes him on as an apprentice. Yes, all the cliches with a very straight face. Meanwhile, the Princess meets the rover girl, Eretria ( Ivana Baquero ) - who tries the same roofie trick. The rover girl meets up with the boss of her thieves' clan - Cephelo (James Remar - Inferno (1998) ), who is also her father. 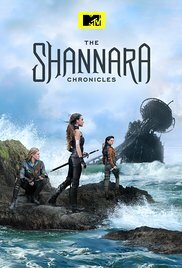 Daddy wants to sell his little girl into an arranged marriage, but she proves her worth as a crook by showing him the magic Elfstones of Shannara. The evil villains attack the Chosen, AKA the first seven who passed the Gauntlet test last week. Surely there must be a replacement team, a second seven who can be baptised or knighted or whatever. But until they develop a contingency plan, the Princess is their only chance. The farmboy joins the Druid as they ride across the beach used regularly in Xena: Warrior Princess . He finds the Princess when she is bathing naked under a waterfall. All the cliches are followed. We do not see the good stuff, and she is a much better fighter than he is. However, despite getting the advance warning she still insists on charging headlong into danger. The Mentor is wounded, so the Farmboy and the Princess go to get something to heal him. The rover girl takes them to meet up with the boss of her thieves' clan - Cephelo (James Remar - Inferno (1998) ). He has his own agenda, to gain the power of the Elfstones. This means he arranges a chick-fight between his daughter and the Princess. The Farmboy and the Princess have a new friend. He has a superpower too - he can forsee peoples' deaths. Someone will try to assassinate the Princess! The Rover girl breaks into the Elven Palace. They are meant to be on high alert, with a demonic assassin on the loose, but she has no trouble getting in. Unfortunately the Elves are terrible investigators as well as terrible guards. They assume that the thief is also the assassin. We get a flashback to the events ten years ago. The Elven Princess was a tomboy at the age of eight, but her father encouraged her. However, the elves were busy quashing a rebellion by the gnomes - not nice little garden gnomes, but ugly misshapen orc-like creatures that used ninja-style throwing stars. Unfortunately for the Elves, the palace guards were terrible at their job. The Farmboy and the Princess lead a platoon of guards on their quest. They take the Rover girl with them - in chains. However, Cephelo (James Remar - Inferno (1998) ) and the Rovers live in the forest. An ambush is inevitable. Allanon (Manu Bennett - Arrow ) is back at the Elven palace, helping the army to prepare. But the demons knew that to defeat the Elves they must split the alliance with the Druid. If they frame Allanon, the Elves will exile him - their only real defender. The Elven Princes would rather concentrate on fighting demons rather than protecting the magic tree. Well, at least they admit that the demons are real. However, they need a guide to help find out where the demons' base is. And the only one suitable is a Gnome warrior who has spent ten years in the dungeon. The Elves on the quest encounter some polluted land. Nobody knows what is wrong with it - an Elf scout seemingly dies of radiation poisoning, but it is also highly inflamable. Apparently the human race caused massive destruction three thousand years ago. However, this is the first time the post-Apocalyptic setting actually plays an important role in the story. The Elves take a shortcut via the abandoned fortress of Pykon. They discover that it is not abandoned after all. There is an old elf there, and a young girl he says is his daughter. However, Cephelo (James Remar - Inferno (1998) ) realises that there is something wrong with the scenario. If anything, the old man's relationship with his daughter mirrors the one between Cephalo and the Rover Girl. The shape-shifter somehow survived having its neck broken. It has now assumed power in the city, and tricks an Elf-Prince into searching for a magic sword hidden in the basement. He does this to turn the elves against Allanon (Manu Bennett - Arrow ). The massive demon from the previous episode somehow survived from being blown up. Yes, the Evil Overlord has some really hard-to-kill minions. Our heroes were last seen falling into a great snowy chasm. The farmboy wakes up hundreds of miles downstream. He meets a violent Elf from a distant village. They get chased by Elf-hunters - humans who kill elves and sell their ears to gnomes. The Princess and the Rover Girl go on the run together. They end up trapped in an old American High School, left abandoned from the Age of Man. Finally, seven episodes into the show, we get a storyline that actually acknowledges the post-apocalyptic setting. It turns out that they are in the San Francisco area, before some catastrophic event improved it by making it look like New Zealand. The girls start to bond, and there is a bit of character development. The Princess picks up a handful of 8-sided dice, perhaps a reference to the link between Fantasy novels and role-playing games. The Rover Girl reveals a bit about her personal history. It seems she had a female lover once, so perhaps her flirtation with the Princess in the bath last episode was sincere. King Eventine Elessedil (John Rhys-Davies - Raiders of the Lost Ark ) sends BOTH his sons to kill the evil overlord. They follow his orders blindly and without question, no matter how ridiculous they are. Meanwhile, Allanon (Manu Bennett - Arrow ) has been stabbed through the chest. It turns out he teleported out in time, but he still has a massive wound. At least when he is magically healed it is by LITERAL magic. The Elf-Hunters sell the Rover girl as a slave. However, the man who buys her sets her free. He rules a small human village named Utopia. They have begun to rebuild pre-apocalyptic technologies, such as guns and electricity. They must have lots of bullets, because they are perfectly happy to waste lots on target practise. They use the electricity for lighting and to run a 2-reel movie projector. Their favourite show is clips of Star Trek: The Original Series . This should be a clue to the problem, because they have Kirk's relativist morality of the needs of the many outweigh the needs of the few. Cephelo (James Remar - Inferno (1998) ) is back, still playing an angle. But he could be a useful person to have along, so the Farmboy and Princess let him tag along. After all, he has had dealings with the Utopians before and he knows that something is just not right about them. Utopia is a human village in Troll territory. Anyone who has seen post-Apocalyptic shows like The Walking Dead should know that if it looks too good to be true, it is not true. However, there is another side to it. The residents are keen to rebuild human society, and have technology that could defeat the demon army and restore a Twentieth Century standard of life to the Dark Age societies. Is it acceptable for our heroes to sacrifice not only the lives of innocent villagers, but also the only hope for scientific advancement and progress? The good news is that Safe Hold, our heroes' destination, is San Francisco harbour. The bad news is, the Golden Gate Bridge is long gone. The good news is, there is a tunnel under the bay. The bad news is, it is full of sleeping trolls. The Druid Allanon (Manu Bennett - Arrow ) is teaching the magic-user boy. However, the Evil Overlord still has influence over him. It is not a question of will the boy snap, but rather when? The Elves apparently have a High Council. This was never mentioned when the evil shape-shifter was ruling as Absolute Monarch, but now becomes an issue because the new King is in danger of doing a good job. Luckily, the new King has an alliance with the Gnome King. Will that convince the Elves to follow him, or will it mean civil war? The Rover Girl, the Farmboy and the Princess head for home. But they must go through the Troll tunnel again. Not to mention Utopia and the mountains. Yes, even if they steal some horses it should still take a few episodes to cover the distance. Allanon (Manu Bennett - Arrow ) prepares the Elves' defences for the big battle. Yes, you probably imagine this as looking like something out of the Lord of the Rings movies, although on a lower budget. The truth is that it far more closely resembles a scene from Hercules: The Legendary Journeys . Instead of convincing CGI or top-class prosthetics, the Evil Horde is represented by extras wear halloween masks. This episode is the big climax, especially for Farmboy and one lucky lady. There are a few other cliches that get a look-in. For example, the Evil Overlord was deemed unkillable but it seems nobody ever tried to creep up behind him and chop off his head. Also, while the cliche is that Evil Overlords turn into giant snakes it seems that the good-guy equivalent is to turn into a magic tree. As always, there is a cliffhanger ending that will lead into the next Season. The author made this series drag on for decades. However, unlike Game of Thrones he made it into self-contained trilogies, so one could enjoy the story without making it a lifetime commitment. Eretria ( Ivana Baquero ) has last seen facing off against a small army of ogres. A year later she has become a super-ninja, capable of killing three heavily-armoured ogres without breaking a sweat. Oh, and she can survive a fall from the Golden Gate bridge - although magical intervention by Amberlea the Magic Tree may be part of it. Eretria is living in a rover town built in the ruins of San Francisco. She has a new father figure to replace Cephalo. This one has an interest in science, which could make him a very powerful person if he could take advantage of the vast amounts of ancient technology in the Bay area. However, this is off because this story is set in a world where Clarke's Law does not apparently apply. The power of the druids is not merely some advanced technology that looks like magic - it actually IS magic! Elsewhere, Wil Ohmsford (Austin Butler - Arrow ) has settled into life as a healer living among the gnomes. Yes, he has abandoned both the humans and the elves. A strange girl, Mareth ( Malese Jow ), takes an interest in him. There is a good reason that Wil is not living in the Elf-King's city. The Elven Army has begun to persecute and murder all magic-users. The Elf-King's plan is to make an alliance with the human kingdom. Yes, there is a powerful kingdom of humans who were never even mentioned in the previous Seasons. The main characters, Wil Ohmsford (Austin Butler - Arrow ) and Eretria ( Ivana Baquero ), now have different love interests. These love interests now have a lot in common. They are both beautiful young women, which makes up for the fact that Amberlea is not a cast member any more. Also, they both have very important parents. Wil Ohmsford (Austin Butler - Arrow ) and Eretria ( Ivana Baquero ) team up again. However, Allanon (Manu Bennett - Arrow ) has been imprisoned by rebel Elves. The natural rescue plan is the oldest one - the wookie prisoner trick. We get a bit of exposition about the Elven army. The General is the local equivalent of Blade . His mother was attacked by a demon when she was pregnant with him, and now he is immune to magic. His plan is to stage a military coup against the Elven King, in order to kill all magic-users. The Elves still have a massive army, even though the evil overlord was defeated last year and the humans and gnomes are peaceful allies. Of course, the General must have refused to downsize his force. Instead of using it to defend the kingdom, he uses it to defy the government and oppress the citizens. But it turns out that his Elven soldiers are as weak as humans. Eretria ( Ivana Baquero ) manages to take out a couple of them with her new ninja skills. The heroes discover that the magic-hating Elves are armed with weapons from the Human kingdom. Nobody wonders why the Elven Army did not just use their own weapons. They need a new shipment, although there are dozens of perfectly good swords lying around among all the guards that the heroes killed. The Elven King begins to suspect that his best friend, the General, has not been entirely truthful. Well, the Elven army has pretty much mutinied against Royal authority. Unfortunately the King does not listen to the will of his people. Allanon (Manu Bennett - Arrow ) takes Wil Ohmsford (Austin Butler - Arrow ) and his GF Mareth ( Malese Jow ) to recover the magic item. He left it with the body of Wil's father, concealed in a crevasse. This leads on to an unhappy mix of science and magic. They use abseiling ropes, which they may have obtained from a post-apocalyptic source, even though they act as if they have expert training. However, inside the crevasse they have a magical encounter. The guardian is a monster, the spawn of Shelob and a giant octopus. It can only be defeated sith Shannara magic. Elsewhere, Bandon the demon-lover takes an old man along for company. They go to the farmhouse where the demon-lover grew up. Unfortunately the elven peasants who live there are deeply prejudiced against magic users. This will not end well. Wil Ohmsford (Austin Butler - Arrow ) and Mareth ( Malese Jow ) accompany Allanon the Druid (Manu Bennett - Arrow ) on his next quest. 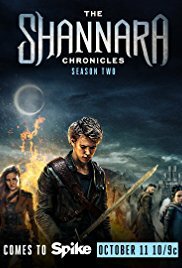 Despite having the mystical Elf-Stones of Shannara, now they must get another super-weapon ... the mystical Sword of Shannara. They run foul of the young magic-user, Bandon, who has a grudge against Allanon for ruining his life in Season One. The Token Black Ninja goes to deliver some blood money to the widow of his favourite deceased minion. Unfortunately the fanatical magic-hating Elves are on the rampage. Of course, he can defeat eight men at the same time and there are only four Elves, so the outcome is predictable. His next step is to take a prisoner back to the Elf-King, so they can use the usual Jack Bauer tactics. Eretria ( Ivana Baquero ) meets up with her former mentor. Not Cephalo, he is long gone. No, it is the San Francisco dude. He is a Druid, but not like Allanon. Instead he uses technology. But does this mean that Allanon's magic is really high-level technology, as predicted in Arthur C. Clarke's law, or is the magic genuine? Wil Ohmsford (Austin Butler - Arrow ) and Mareth ( Malese Jow ) have gone back in time a couple of years, to Wil's home village before he was even born. They must recover a magical skull for the villainous wizard Bandon, or else Allanon (Manu Bennett - Arrow ) and the other hostage will be killed. Of course, since Allanon is the most powerful character he has been invalided out of the quest. Meanwhile, Wil has to keep his parents together, like Marty McFly in Back To The Future . Eretreia's mentor has abandoned her. However, she teams up with the bounty hunter again against a mutual enemy � the Elven magic-haters known as The Crimson. The evil elves have captured the human capital. Luckily, it turns out that the best warriors are ... the gnomes. Yes, like everything else in the Shannara-verse this makes no sense. Mareth ( Malese Jow ) goes into Allanon's subconscious, and tries to bring him back to reality. Bandon wants to raise the Warlock Lord from the dead. He takes the requisite bits and pieces to the Crimson's fortress. Yes, the same supposedly impregnable fortress that was easily infiltrated by the good guys a few episodes ago. We gets a reminder that this is a post-apocalyptic world, because the fortress is made of steel rebar and barbed wire. It turns out that Bandon's magical telekinesis is similar to Magneto's power in X-Men , and as a result he can weaponise the fort's components against its guards. Wil Ohmsford (Austin Butler - Arrow ) goes to the Elf palace, to see Amberlea the magic tree. She was his love interest in Season One, and this is their chance to get some closure. Eretria ( Ivana Baquero ) goes to save her friends from the Crimson. Unfortunately the Elf General is more concerned with persecuting Allanon (Manu Bennett - Arrow ) and Mareth ( Malese Jow ) than he is with securing his own fortress and defeating the actual villain, the Warlock Lord. Bandon gets the resurrected Warlock Lord to give him his heart's desire. This involves raising Kitania ( Brooke Williams ) from the dead. Yes, now we find out what happened to her body after she was murdered. How he got her out of the human palace, and where he has been keeping her in the mean-time, is not explained. However, despite being much fresher than the centuries-old Warlock Lord her revival is not as easy. The good guys all meet up in the ruins of San Francisco. How it survived a nuclear war, as well as the earthquakes that followed, is never explained. Wil's love interest is the Princess of the Elves, while Eretria's is Princess of the Humans. The Warlock Lord does not need Bandon any more. However, he can sense Eretria's dark power. She has a secret tattoo, and when she turns evil it glows red. The Warlock Lord takes the human Princess to the pumping station. He plans to polute the river that flows into the lake ... by bleeding into it. Yes, all the cliches of the Lord of the Rings pastiche sub-genre abound. Worst of all, it is set in a post-apocalyptic world. Eretria ( Ivana Baquero ) goes to the human palace and gets the weapons master to show her the flood-gate controls. The bad news is, she has been possessed by an evil magical wraith. The good news is, the techno-druid can fight wraiths with his cattle-prod. This nicely ties up the Season, although the main antagonist was written out in the previous episode and our heroes now have to contend with a stereotypical Evil Overlord out to destroy and/or enslave the world. Anyway, despite a satisfactory ending there is still a setup for the next Season.